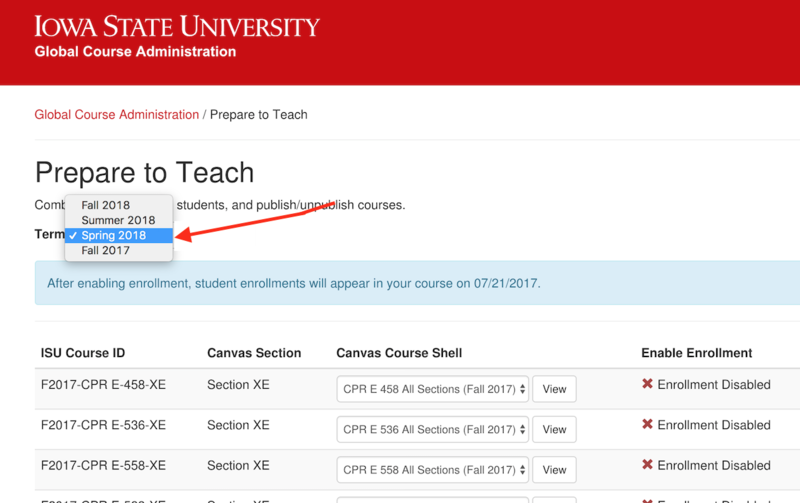 There are three important steps to making sure your Canvas course page is available to students: requesting a course, enrolling students (which may involve mapping to the correct course sections), and publishing your course. 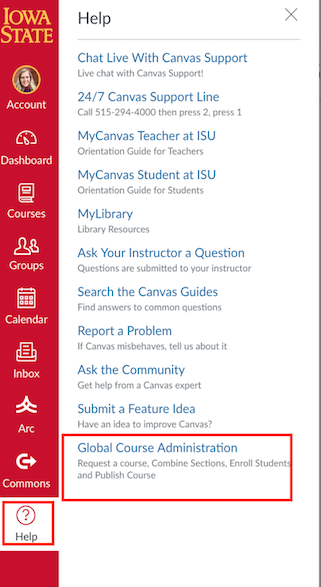 After logging into Canvas, click Help on the left red global navigation menu and go to Global Course Administration. You will be asked to authorize your user account to proceed. After selecting Prepare to Teach, find the ID of the course you want in order to create a new Canvas page. Click the green Create button. You can click View to then access that new course page. This course will be connected to student enrollment. Note: if you want multiple sections of students to access the same Canvas page (such as BRT 501 A and BRT 501 XW), you will need to follow the instructions under “Mapping Student Sections” below. 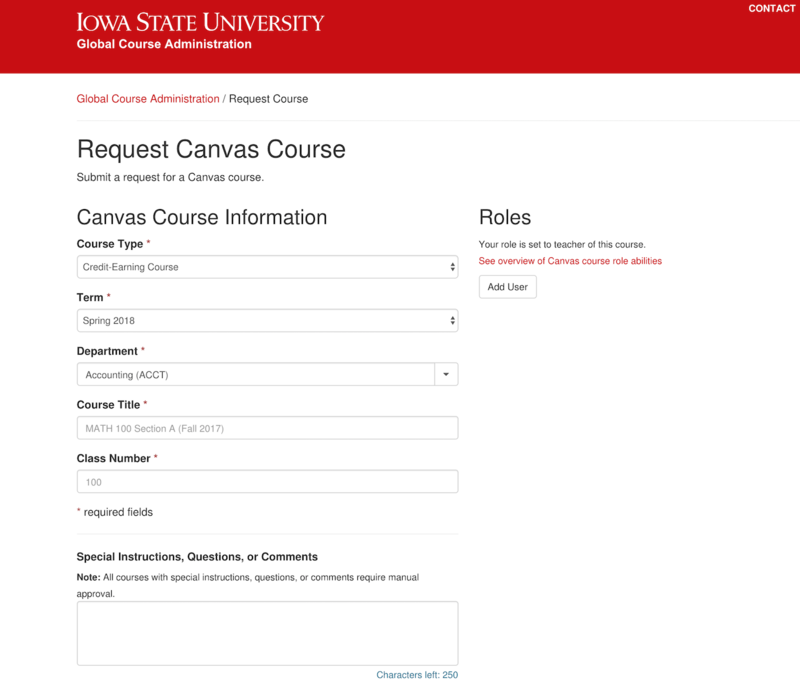 (OPTIONAL): You can also request Request a Canvas Course from Help>Global Course Administration>Request Canvas Course. This process allows you to request a course prior to the course being officially listed in the schedule of classes. Complete the information on the screen to request your course. Note: Be sure to add any TAS, designers, or other users in the “Roles” section.This course will need to be connected to student enrollment by following the mapping process explained below. If you requested a course page by using the method in step #3 via Request Canvas Course, you will need to connect your course to student enrollment. Once your course is listed in the registrar’s system (ADIN) and you are listed as the instructor of record, you can do this step. If needed, this will also allow you to enroll additional sections into the same Canvas page. Note that course pages/shells will not be created automatically. If needed, start by selecting the appropriate term by selecting the drop-down. Select Confirm to make this change. (Optional) If you have another course section you would like to have enrolled in the same Canvas page, locate the course ID of that section (for example, M E 518 XE) and choose the name of the page from the dropdown list. Click View to ensure the course is now being directed to the correct course. This will open a new tab. 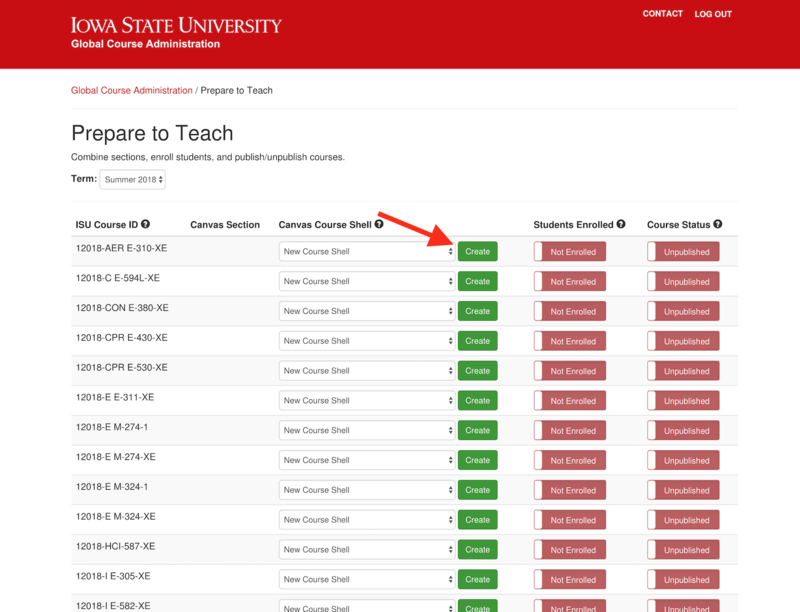 If you return to the “Prepare to Teach” browser tab that you opened previously, you can enroll your students from this screen by selecting the green Enroll Students button next to the appropriate ISU Course ID section. Enrolling your students does NOT make your course available to students. If you want to publish your course, you can do this using the green button to the right of the Enroll students button. Publishing your course AND enrolling your students makes the course available to students for the ISU start of term. If instructors would like to change student participation dates, they can do so via the “Manage Sections” link in ISU Admin tools. At this time, the previous semester’s courses will also be made unavailable.